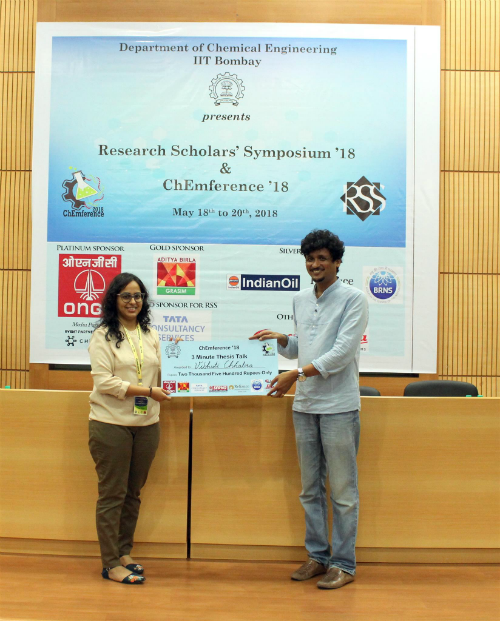 Vibhuti Chhabra presented a poster titled “Thermochemical conversion of mixed municipal solid wastes” at the Chemference conference held at IITB from 18th to 20th May’18. She participated in the 3MTT competition and won the best presenter award. The poster presented the mechanism of the pyrolysis of MSW. The results were obtained from the experiments conducted at the Australian Synchrotron and Monash University. Her research project is being sponsored by JSW.